In Lean-Agile, the delivery of value involves the effort of people from all across the value stream: executive, management, and front line teams. People from the Business and technology work together to discover and deliver work that customers can use and can realize value from it. The following tables show the roles that are in various levels and offer links to Reading Paths and descriptions of many of the roles. To see roles in the context of the work of Lean-Agile, see the example RACI Chart for Lean-Agile. Here is a quick description of the levels. Portfolio Level. The Portfolio Level includes a diverse group of stakeholders working across organizational boundaries. The Portfolio Level is responsible for priority, the order of work, and deciding what is active. Roles involved in the portfolio include the Value Stream Owners and the sponsors. The Business engages with the technology organization at the Portfolio Level. In many organizations, Portfolio Level work is carried out by a PMO. Program Level. The Program Level is the center of responsibility that is focused on an application area. Work is comprised of releases, enhancements, production support, and maintenance requests. This level also is responsible for program ecosystem and operational metrics. Team Level. The Team Level is composed of development teams and shared services. Each development team is composed of the developers, testers, analysts and SMEs required to produce and implement a Business value increment, for quality assurance, and continuous incremental improvement. 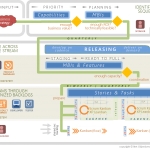 A team’s work is composed of the stories and tasks for a specific release, enhancements, production support, and maintenance requests. Skills needed in a team typically include analysis, design, code, build, deploy, testing, acceptance, validation, and implementation. Extended skills needed might include: Architecture and design, build and release management (environments), SEO, and subject matter/domain expertise (technical, Business, and customer). Note: These roles are often limited; they are not expected to participate in Daily Stand-ups or retrospections unless they are a member of the core team.